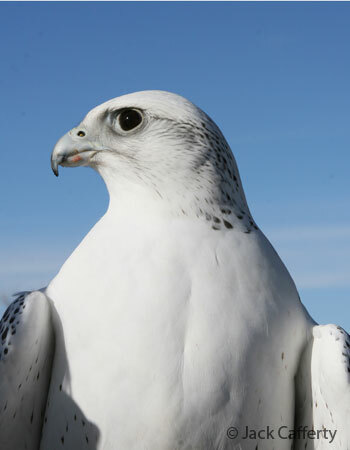 The Gyrfalcon is the largest true falcon in the world. They have a variety of plumage colors that range from a dappled white to almost pure black. Gyrfalcons have been highly regarded by falconers throughout falconry’s history. In the Middle Ages, only a king could hunt with a Gyrfalcon. Gyrfalcons that nest in the arctic regions frequently begin breeding and laying eggs when the temperature is still below freezing. 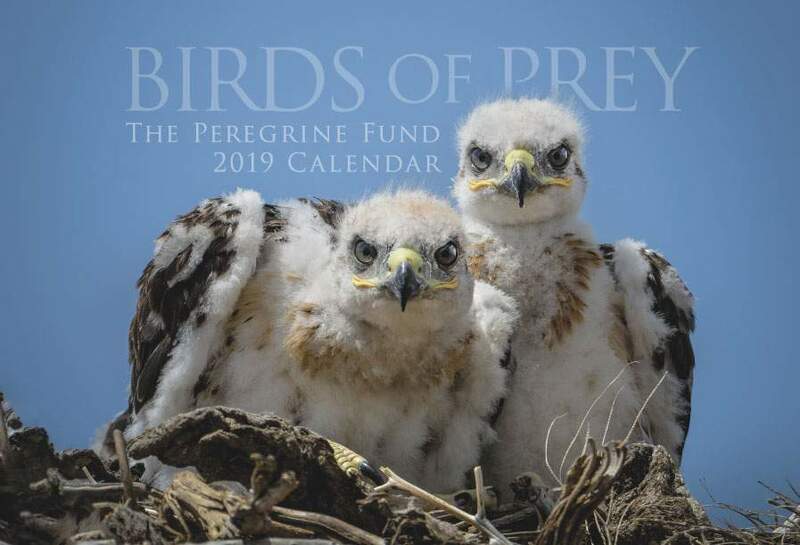 For more than three decades, The Peregrine Fund gathered information on the behavior, nesting habits, migration patterns, and diet of the Gyrfalcon. 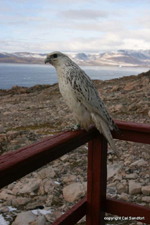 Traveling on foot, by kayak, helicopter, sea boat, and even dogsled, biologists gathered data on Gyrfalcons and their prey in Greenland. This research helped to increase our understanding of these beautiful birds of prey. 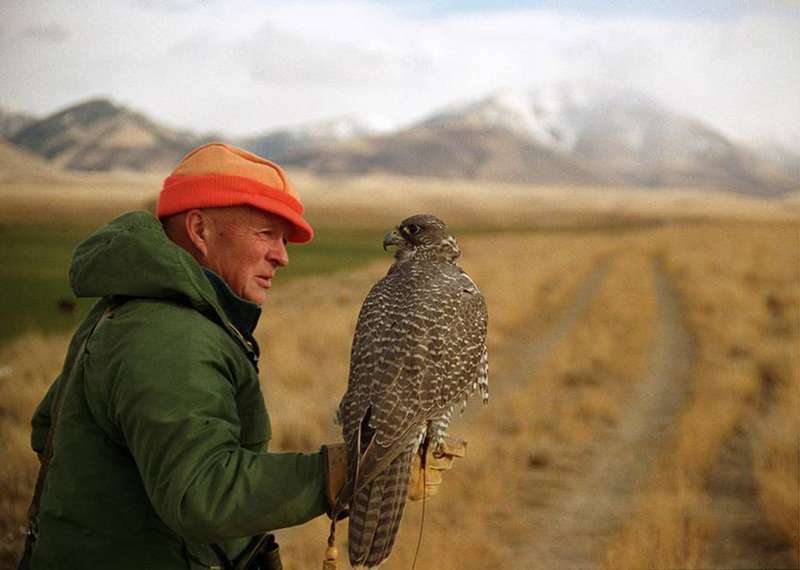 In 2011, The Peregrine Fund, together with Boise State University and the U.S. Geological Survey, hosted a conference, "Gyrfalcons and Ptarmigan in a Changing World." 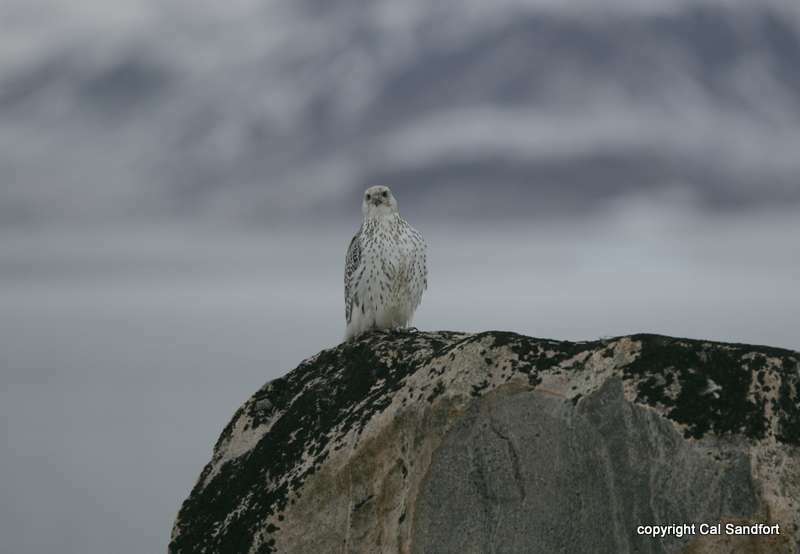 The conference brought together experts from around the world to share information and understand what factors affect the populations of Gyrfalcons, ptarmigan, and other prey. The participants developed a plan for research and conservation of these species. 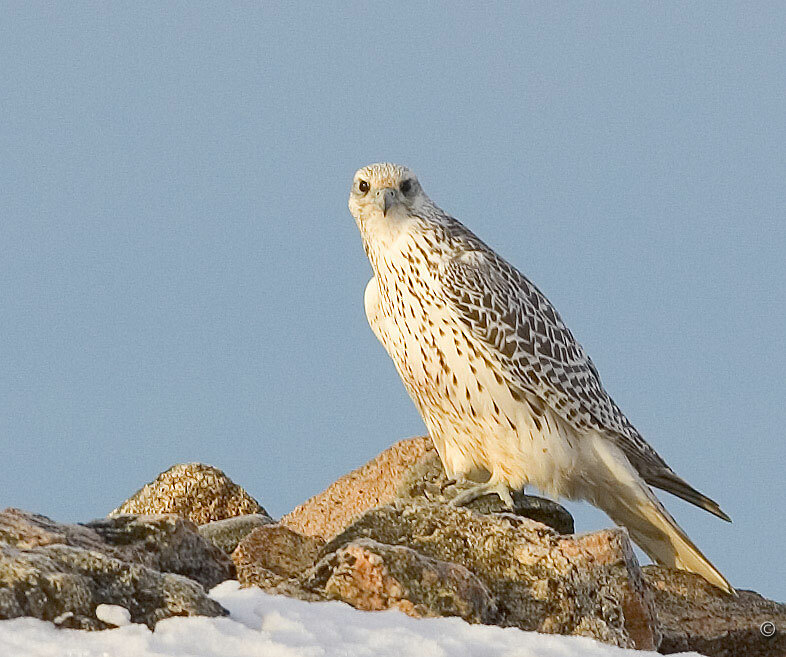 The Gyrfalcon thrives in some of the harshest climates on Earth. This denizen of the mountains and high arctic tundra is a circumpolar species, found throughout the region of the North Pole. It nests in the arctic and subarctic regions of North America, Europe, Asia, Greenland, and Iceland. Individual falcons that live in the high arctic portion of their range are migratory and move further south in the winter months. However, individuals that live in lower arctic areas tend to be only partially migratory, meaning some may migrate while others remain in their territories year-round. Scientists have documented some Gyrfalcons traveling as far south as northern Oklahoma in the winter in search of prey. 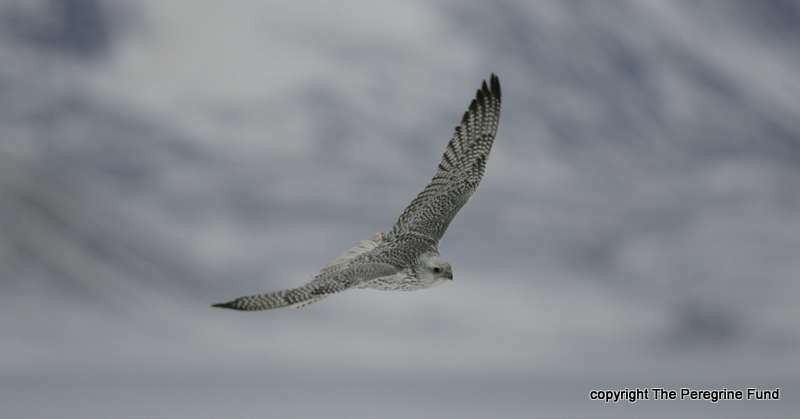 Gyrfalcons live in tundra (treeless heath plains) and taiga (swampy coniferous areas). There, they are often found near bluffs and cliffs along shorelines or rivers. They can also be found in barren uplands or mountains, often above the tree line. 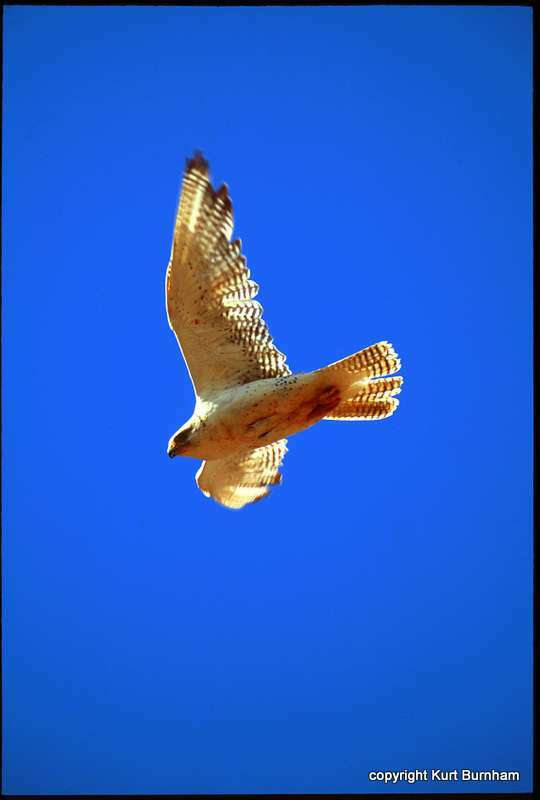 During migration, some Gyrfalcons are known to pass through small settlements or towns. Biologists have been studying Gyrfalcons for decades but there is always more to learn. 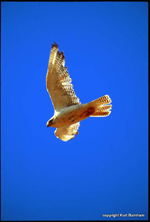 Scientists once thought that Gyrfalcons were tied very closely to land, where they perch, hunt, and nest. While this is true in many cases, scientists discovered as recently as 2011 that some Gyrfalcons spend a lot of time in the winter out on the ocean far away from any land source. 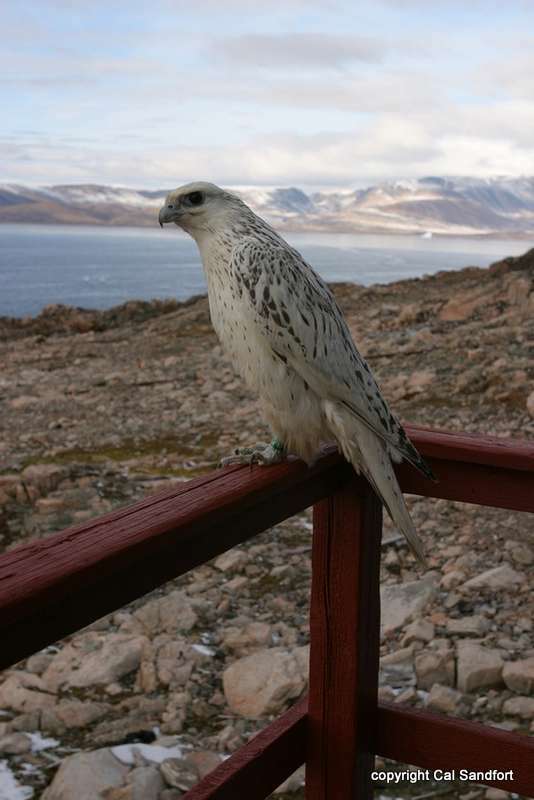 There, the falcons are most likely feeding on seabirds and perching on icebergs or sea ice to rest. Like many raptors, Gyrfalcons are top predators – they hunt other animals for food but no animals hunt them on a regular basis. 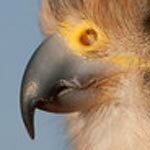 They are occasionally hunted by Golden Eagles, though this is rare. The Gyrfalcon is strong and swift and very few animals dare to take it on. Top predators play an important role in nature. They help control populations of prey animals and help maintain a balance in the ecosystems in which they live. For most top predators, their only threat is humans. As a rule, birds of prey are very sensitive to changes in the environment. Their populations may be affected by an increase of pesticides in the environment, a loss of habitat, or a decrease in prey numbers. The effects of climate change on birds of prey are also becoming more clear. 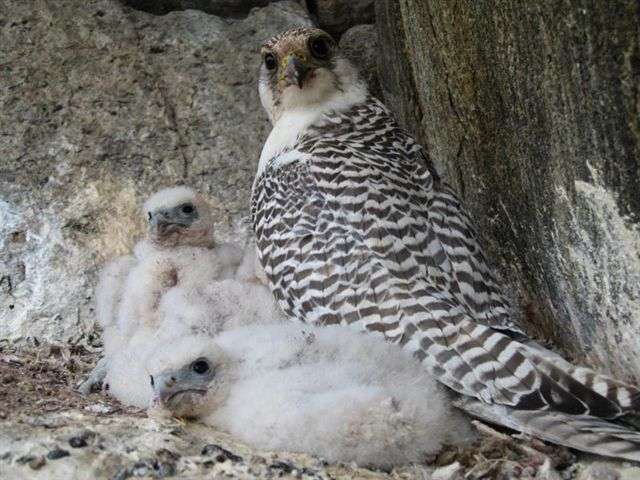 In the case of the Gyrfalcon, scientists believe that warming temperatures have likely allowed another northern resident, the Peregrine Falcon, to expand its breeding range further north than ever before documented. This could cause competition between the Peregrine Falcon and the Gyrfalcon for limited nest sites. If this were to occur, the Gyrfalcon might not be able to find enough good places to nest and so could be forced to stay only in the far northern extremes where competition is less, but where life is much harder. 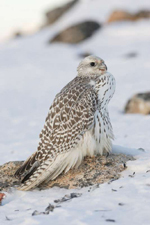 As you can imagine, living in the extreme north is extremely challenging, even for the Gyrfalcon, a bird adapted to survive in cold and arid habitat. But things may soon be getting even harder for this raptor and all the plants and animals that depend on the Arctic for survival. 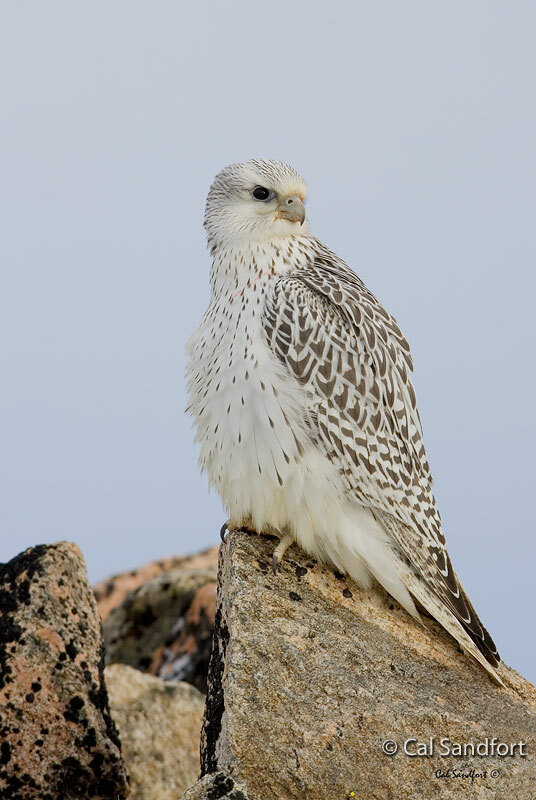 With the mean annual temperatures in the Arctic having increased at almost double the rate of the average recorded across the globe, the future of the Gyrfalcon and many other arctic species may be in peril. More than ever, arctic species need our help and support. Gyrfalcons, like other falcons, eat mainly other birds. They prefer to hunt ground birds such as ptarmigan and grouse but also hunt seabirds and waterfowl, as well as land mammals such as ground squirrels, lemmings, voles, hares, rabbits, and marmots. Gyrfalcons often hunt using a fast, low flight to chase their prey. Just before catching the prey, these falcons typically fly up and then dive straight down onto their prey. Prey can be taken in the air, on the ground, or occasionally even from water. Like other falcons, Gyrfalcons do not build their own nests. Instead, they lay their eggs in a natural or scraped depression on a cliff ledge. Sometimes they use an abandoned stick nest of another bird, such as a raven, or man-made structures. 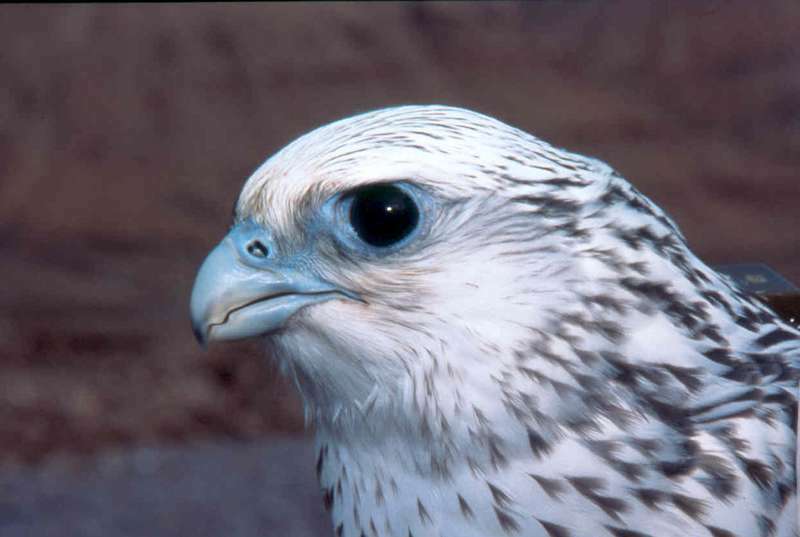 Female Gyrfalcons lay three to five eggs and incubate them for about five weeks, after which the young chicks hatch. The adult falcons work hard to support their young, spending countless hours on the hunt. When they feed their young nestlings, the adults rip off small pieces of meat and gently pass them to the chicks. As the chicks grow, the adults start giving them larger pieces, then whole prey, so they can practice feeding on their own. 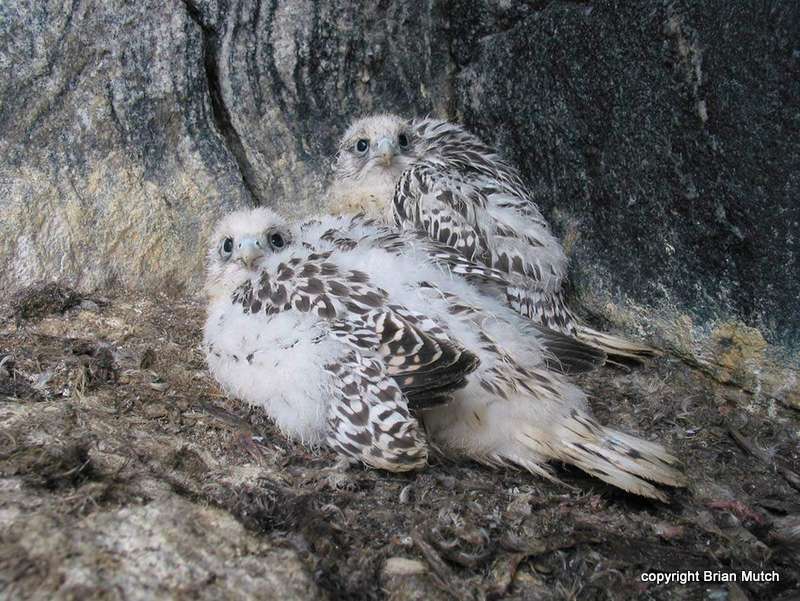 In addition to ensuring that their young get enough to eat, Gyrfalcon parents also vigorously defend their young against potential predators, such as ravens. When they spot an intruder, they fly after it, calling loudly and stooping low in an attempt to scare it away – and it usually works! The young falcons fly for the first time around six to seven weeks after hatching. 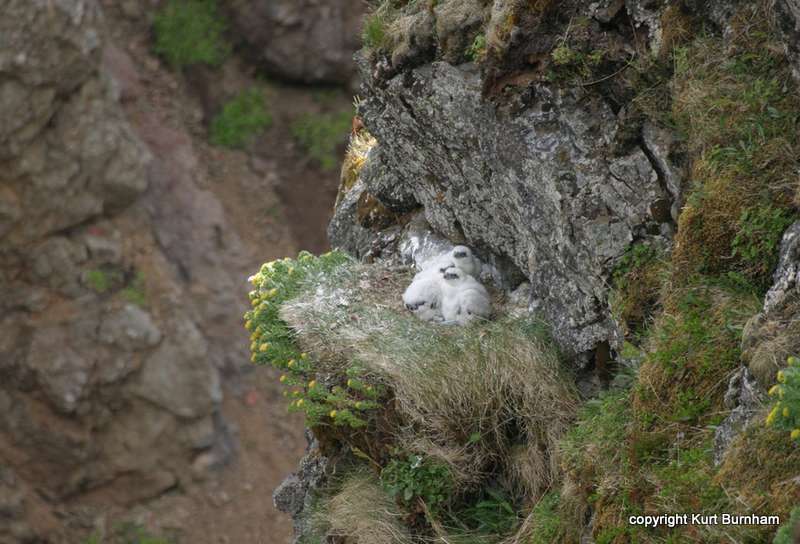 Learning to fly from a steep cliff can be challenging. If the young falcons land on the ground, they can fall prey to land predators such as foxes. These falcons are mature enough to find mates and reproduce when are 2-3 years old. During the winter months, a few Gyrfalcons make their way down to Idaho in search of prey. When prey is particularly scarce, they may even travel as far south as the Snake River Plain. Though not commonly seen, Gyrfalcons have been documented as rare visitors to the state. A visit to The Peregrine Fund's World Center for Birds of Prey is a rare opportunity to a see a white Gyrfalcon up close, or perhaps observe one in flight during our fall outdoor flight shows at Raptor Ridge. 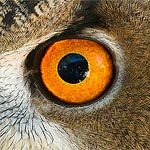 A new indoor exhibit explains the importance of raptors as bio-indicators and how work with Gyrfalcons can lead scientists to better understand the effects of climate change on arctic habitats.